Source Optimized DNA sequence encoding Rat Insulin Growth Factor -1mature chain was expressed in Escherichia Coli. Molecular weight Native Rat Insulin Growth Factor-1 is generated by the proteolytic removal of the signal peptide and propeptide, the molecule has a calculated molecular mass of approximately kDa. Recombinant rat IGF-1 is a disulfide-linked monomeric protein consisting of amino acid residue subunits. IGF-1 migrates as an approximately kDa protein under non-reducing and reducing conditions in SDS-PAGE. Biological Activity The ED50 was determined by a cell proliferation assay using FDC-P1 cells is ≤.0 ng/ml, corresponding to a specific activity of ≥1 x units/mg. Presentation Recombinant Rat IGF1was lyophilized from a.2 μm filtered PBS solution, pH.4. 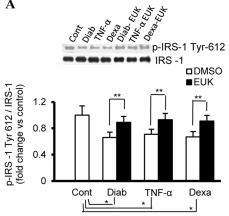 Impaired IGF1 signaling in fibroblasts that have phenotypic features of diabetes, inflammation or hypercortisolemia. Fibroblasts with phenotypic characteristics of type 2 diabetes (Diab) and those of control fibroblasts treated chronically with either vehicle (Cont), TNFα (4 ng/ml every day for 4 days) or dexamethasone (Dexa; 20 ng/ml every other day for 8 days) were serum starved for 24 hours prior to treatment for 15 minutes with IGF1 (50 ng/ml).